hooray for discovery: Chamomile Cafe! 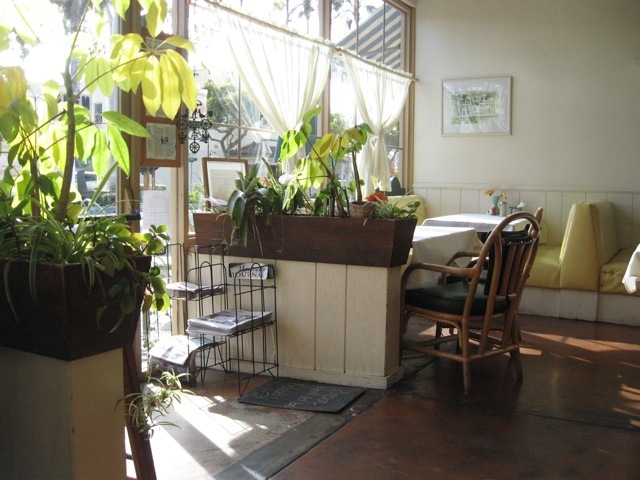 i discovered this delightful cafe in carpinteria, and it’s mostly all vegan with the exception that they serve wild salmon, eggs, and dairy. it’s also mostly organic! as for the bakery part of the cafe, half of the goods are vegan and they are questionably vegan in a major way because they are so incredibly delectable. 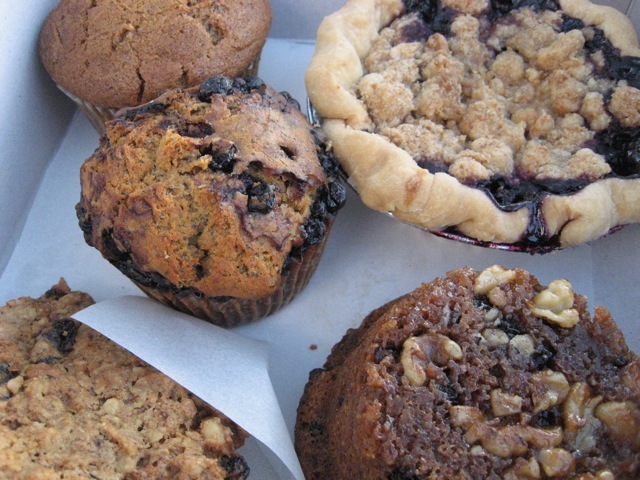 in my big box o’ desserts i tried the blueberry pie in miniature, pecan muffin, oatmeal raisin walnut cookie, zucchini muffin, and the lemon poppyseed muffin with blueberries sprinkled on top. these didn’t last very long.. i shared them with my family and i sort of ate them up! the baked goods are not cheap, but also not overly priced in my opinion because they use organic ingredients and they are insanely good. 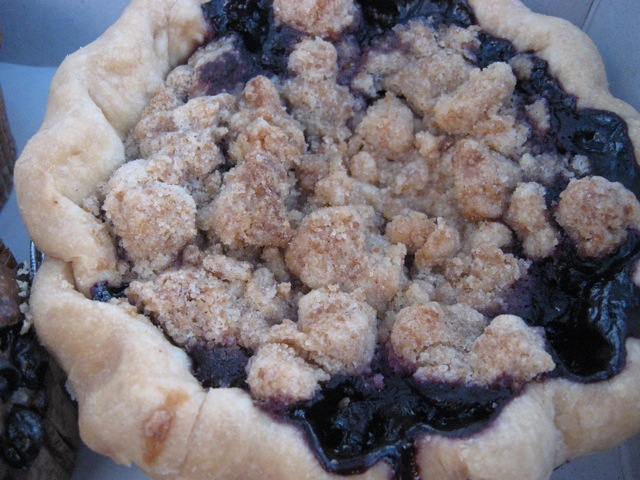 that pie is made with organic blueberries! this place was like finding a little gem all covered in tar (did you know the beaches in carpinteria are dotted with tar?) by the way, i’ve learned that mineral spirits are the answer to tar stains! and now onto lunch: i tried the grilled veggie panino, which is made from their handmade organic ciabatta rolls (YUM) and then inside goes the eggplant, mushrooms, red onions, tomatoes, radish sprouts, vegan ranch, and dijon. you’ll want to be a fan of dijon if you order this. although it’s not overly dijon-y, the mustard is quite noticeable in a very delicious way. 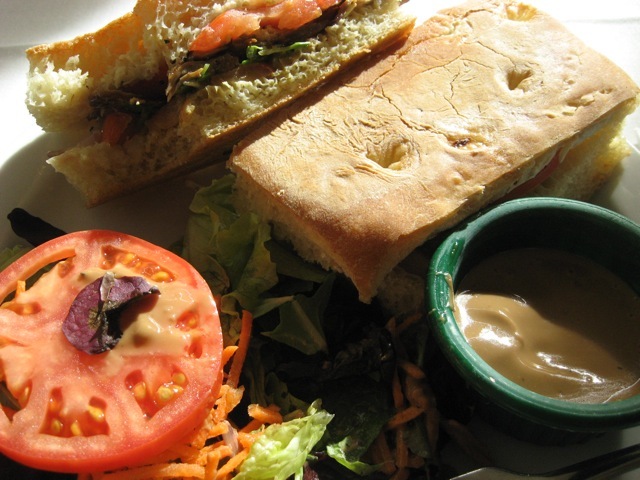 i really enjoyed my sandwich and it also came with a small side salad. i would like to try their dinner menu sometime because it’s all vegan except for the wild salmon. my pescatarian, gluten-free friend enjoyed the wild salmon tacos. thank you, Chamomile Cafe! i should have moved the lettuce off of the tomato, but you get the idea. lets talk japanese organic vegan cafe and bakery in west los angeles! boy oh boy, i hope i get to go back to casa de tree soon. this curry flavored fried tempeh sandwich is so delightful! its a nice crusty curry tempeh slathered with tartar sauce and nestled between a little bed of cabbage and fresh bread of your choice.. i like the six-grain. you will also receive a side of pasta salad and green salad.. always fresh and always good! if you are gluten-free you can rest assured that they use wheat-free soy sauce, but still inquire about gluten in their dishes because there is a lot of seitan on the menu. they have a great buffet for $7.99/lb! and here are some excellent tacos! everyone must try this place. the menu is so creative and not overly priced. by the way, its cash only. go go go! !